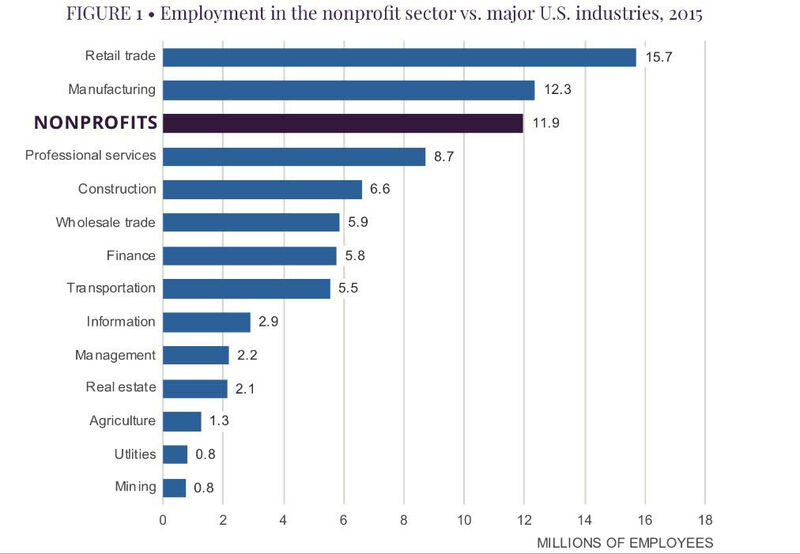 A recently released study found nonprofits are the third largest workforce in the country behind only manufacturing and retail. According to the report Nonprofits: America’s Third Largest Workforce, from Johns Hopkins Nonprofit Economic Data Project, the nonprofit sector in America employs 11.9 million people. As someone who has devoted my career to the nonprofit sector, this is incredibly encouraging. We make a material difference in this country. We have known for a long time that nonprofits play a critical role in building healthy communities. Now, with the release of this report from Johns Hopkins, there is research and validation that the nonprofit sector is as “crucial a component of the economic life in this country as it is to the social, cultural, health and educational life” as the report says. Nonprofits continued to gain ground as employers between 2012 and 2015; however, recruiting and retaining talent in the nonprofit sector is a major challenge. How is your organization investing in finding and keeping your talent? Is the advancement path or path for growth clear to your development team? Don’t make assumptions; talk to your team members about opportunities for growth. Are you providing them continuing education opportunities? Think about including some non-development staff in fundraising training. Last month, we wrote an article about engaging your board. This thoughtful engagement should extend beyond your board to staff and volunteers. Yes, fundraising is critical. You don’t achieve your mission without the generous support of donors. And yes, it can be a challenge to “think bigger” when confronted with looming deadlines, fiscal year-end goals, and day-to-day demands. BUT you have a story, vision and case for support that needs to be shared. Your story should be mission-focused and emotionally compelling as well as data-driven and results-oriented. How does your organization impact your local economy? Can you quantify it? Make sure your economic impact is part of your story. Armed with your story and research affirming your organization’s critical role, leverage your relationships to open doors for you and your organization to create a network of advocates and supporters. The more you share your story and build relationships, the more financial support you will often receive. Equipped with the knowledge and numbers to show how your organization is making a difference, make a case for investment in your business. Many major donors are business leaders and understand return on investment. Organizations who invest in internal capacity building are often those with the best fundraising results. Some nonprofits are incorporating infrastructure-growth-needs into their campaigns. We have been involved in campaigns that included a diverse array of capacity-building components such as staff positions, branding, and technology enhancements. As community and business leaders, major donors value a well-run nonprofit. A strong infrastructure is part of their valuation of success. This report by Johns Hopkins Nonprofit Economic Data Project provides a platform for you to share your organization’s economic impact, strengthen your commitment to building infrastructure, and further establish your organization’s critical role in the community. We know that a healthy nonprofit sector is critical for a healthy economy, strong communities and future growth, and we are committed to supporting your work.